Oorah, the Jewish outreach organization based in Lakewood, New Jersey, is gearing up for May 4, the deadline for entering its latest Chinese Auction, which is being hyped with a slick, colorful brochure mailed to countless homes. We got one in the mail last week. 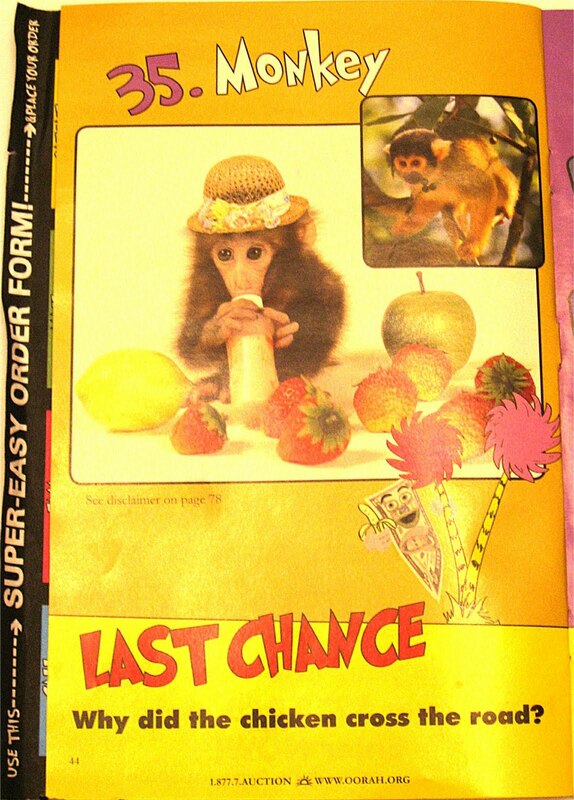 The brochure is filled with lavish gifts, 84 pages of them, including consumer electronics, a trip to Israel, sheitels (wigs), $5,000 towards a simcha or Yeshiva tuition, Judaica collections, complete kitchens, living rooms, maid service, a pre-owned car, and the latest item: a monkey! Yes, a monkey. The monkey offer comes with the following disclaimer: Winner will receive a gift certificate for the value of the purchase of a capuchin, marmoset, squirrel, lemur or spider monkey. The value of the gift certificate shall not exceed $2,800. In states where licensing is required winner is responsible t license. Winner is responsible to comply with all regulations and requirements relating to monkey. Oorah makes no representation as to the legality in any state where winner may reside. As far as we can see, the monkey business is limited to the auction gift. An exploration of Oorah's web site revealed that the organization uses the money from the auctions to run boys' camps and girls' camps and to pay yeshiva tuition (mostly Haredi schools but also some Modern Orthodox schools) for children from non-observant families. Oorah is expressing concern that their their radio Oorah-thon broadcasts will keep children from going to bed on time. 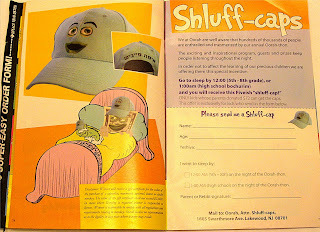 So they are offering a free "Shluff-cap" to 5th through 8th graders who go to sleep by midnight, and to high school students who go to sleep by 1:00 am. The free caps are offered only to kids whose parents donate $72 and send in the form included in the brochure. Although the illustrations follow Dr. Suess's style, they are all original and are none are copied from any of his books. Thanks, Anonymous. Lakewood it is. 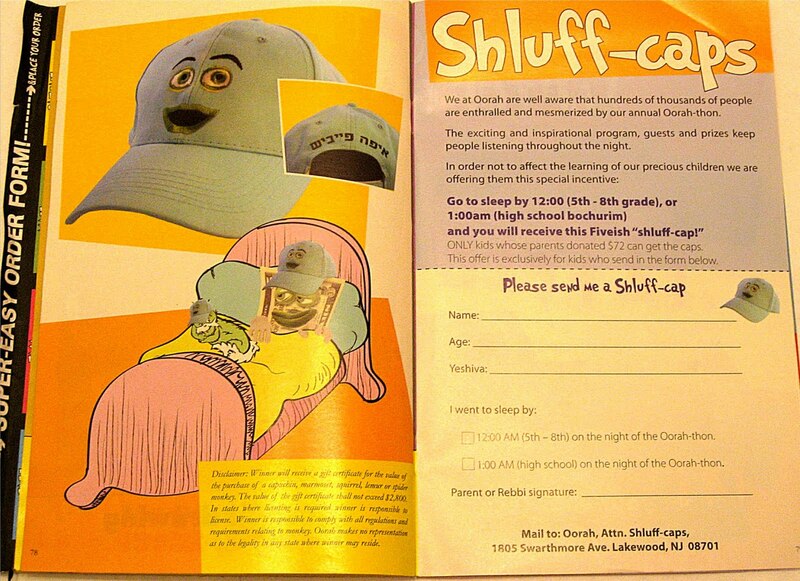 And a tip of the Shluff-cap to you!